View of “Ruth Asawa,” 2017. 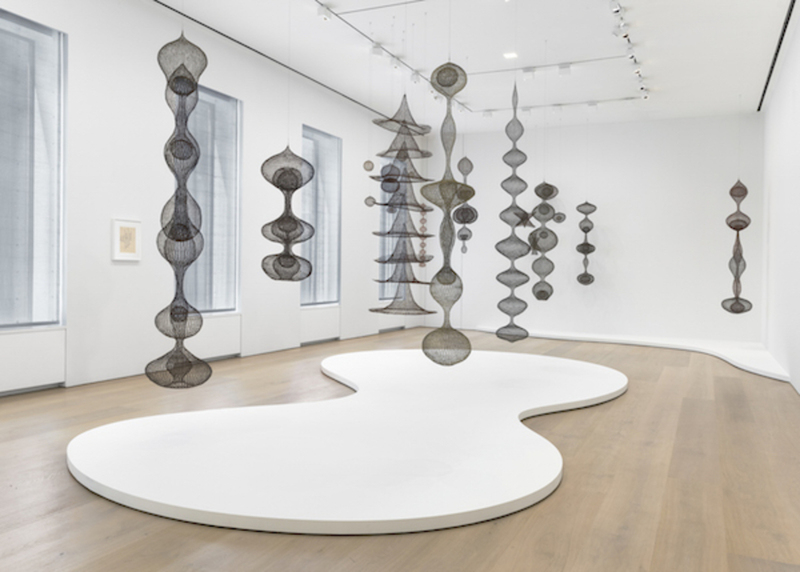 In her lifetime, the artist Ruth Asawa weathered storms of weak interpretation: whole seasons of lazy criticism that made too much of her positions as a wife and mother and not nearly enough of her contributions to modernism and abstraction. Asawa’s hanging looped-wire sculptures were a triumph of line and form, playing with weight, gravity, visibility, the continuity of multiple spheres and cones, and the ambiguity of inside and outside space. Critics in the 1950s read them as women’s work. They also attributed her style to a Japanese aesthetic that was assumed but unsubstantiated. Asawa was born to a family of farmers in California. The singularity of her visual and spatial language came from Mexican basket weaving and Black Mountain College. For better or worse, critical appraisals of Asawa’s art have gained clarity and depth since her death in 2013. The current exhibition, her first at this gallery, spans four decades, adding to our understanding in layers. Across three rooms are twenty-eight exquisite sculptures, including lesser known examples of her tied-wire pieces based on forms found in nature. There are also seven diminutive abstract drawings and paintings in ink, oil, and watercolor, at once playful and revelatory. Untitled (SF.046b, Plain Potato Print in Blue and Orange), 1951–52, is a jubilant pattern of bold and fading spheres, while Untitled (BMC.83, Dogwood Leaves), 1946–49, is a moodier study of shapes and turns. A room with archival materials, including photographs by Asawa’s lifelong friend and neighbor Imogen Cunningham, rounds out the mythmaking. But it is the relationship between Asawa’s paintings and sculptures that remains the most compelling open question.